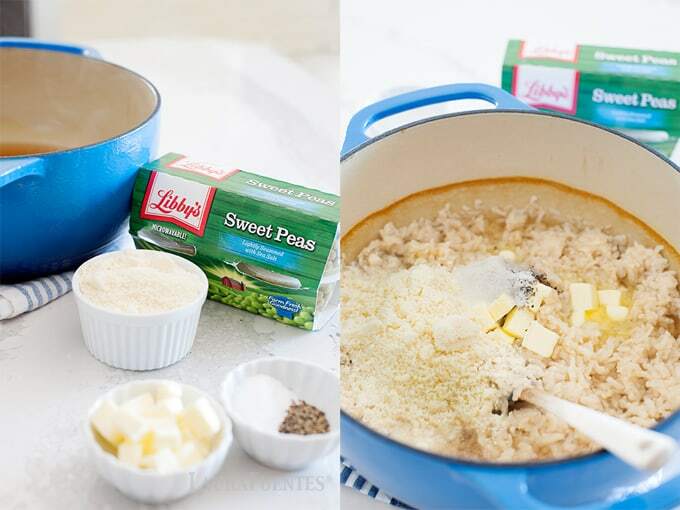 This Easy Risotto Recipe with Parmesan and Peas is brought to you in partnership with Libby’s® Fruits and Vegetables. Thank you for supporting the companies that encourage my creativity. 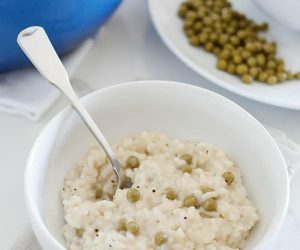 Have you always wanted to make risotto, the creamy rice often served as a side at a restaurant, but after reading the recipe directions needing to stir for 20 minutes, you decided not to? Well, my friend, today is your lucky day! I’m going to teach you how to make risotto where you only have to stir the rice for 3 minutes, max! One of my favorite meals to order at a restaurant is risotto, mainly because it takes so much effort to make at home – the traditional way, that is. I mean, who has time (and patience) to stand over a pot for 20 minutes, adding liquid continuously while stirring and waiting for it to be absorbed? 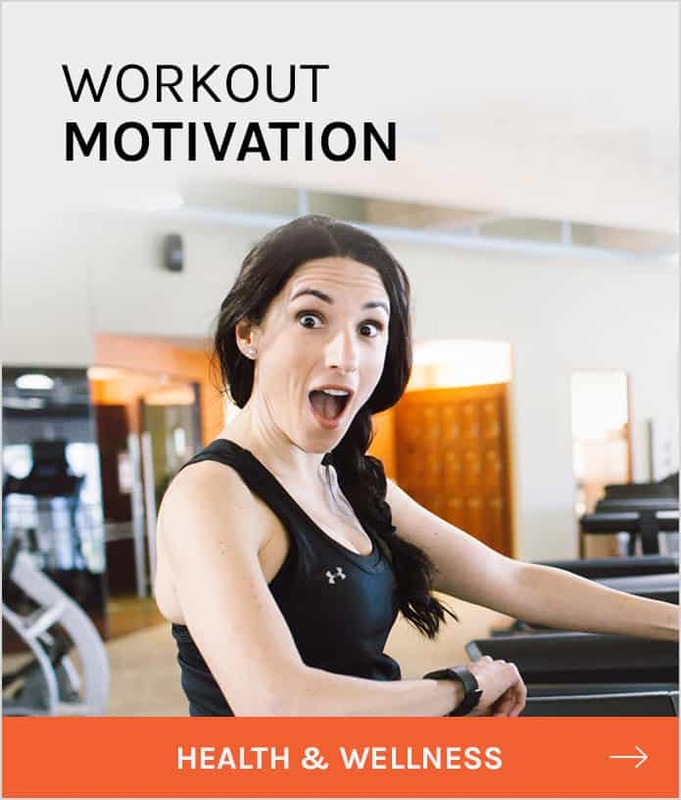 Not this girl. And now that it’s back to school time, our family is busier than ever in the afternoons. It seems that the relaxing attitude of the summertime is gone once we start with schoolwork. Then there are the “mom things” like the laundry that is on the back of the sofa that needs to get folded and put away, supervising my kids’ afternoon class-work and the new puppy that needs attention… You know, all things that seem to call my name. So back to making risotto. I never make it at home, as much as my family loves it, because of the dedication to stirring the rice to make it creamy and starchy. This is precisely why I think you probably don’t do it at your house either, right? 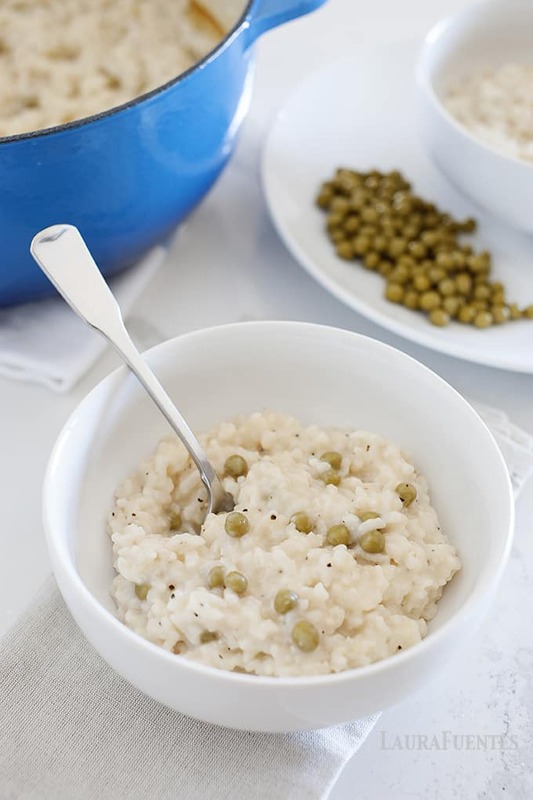 Today’s recipe is for all of us who have either been intimated by the risotto making process or has never had the time. Watch this video first to see what I mean! Of course, the bonus is that I just showed you not only how to make the risotto but also how to get your picky eaters to eat it. Plus, it makes a terrific leftover for lunch idea; and we can call use school lunch ideas, right? Your kids will love this recipe, even the picky eaters because of its cheesy consistency that almost reminds me of Mac N Cheese. And by adding Libby’s Sweet Peas Vegetable Cups to the recipe, I also have the option of serving them on the side for my picky eater. 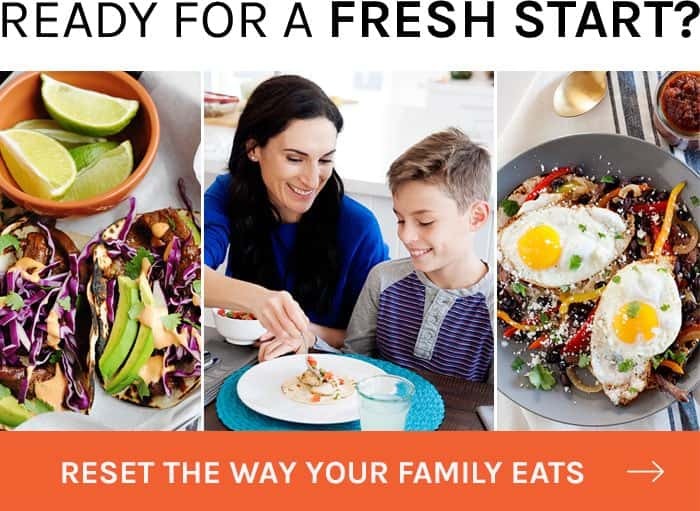 I always have a variety of Libby’s Vegetable Cups in the pantry because they are perfectly portioned, packed with vitamins and minerals, and are an excellent way to customize any meal. They also make a great snack to munch on or side dish at the dinner table. 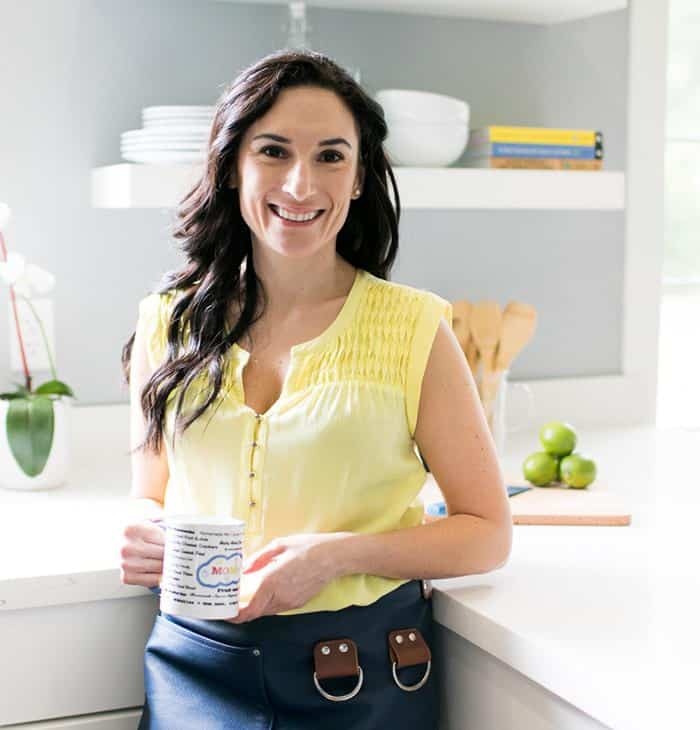 If you’re a busy mom like me, this dish will become a staple in your family meals just like it has in mine. 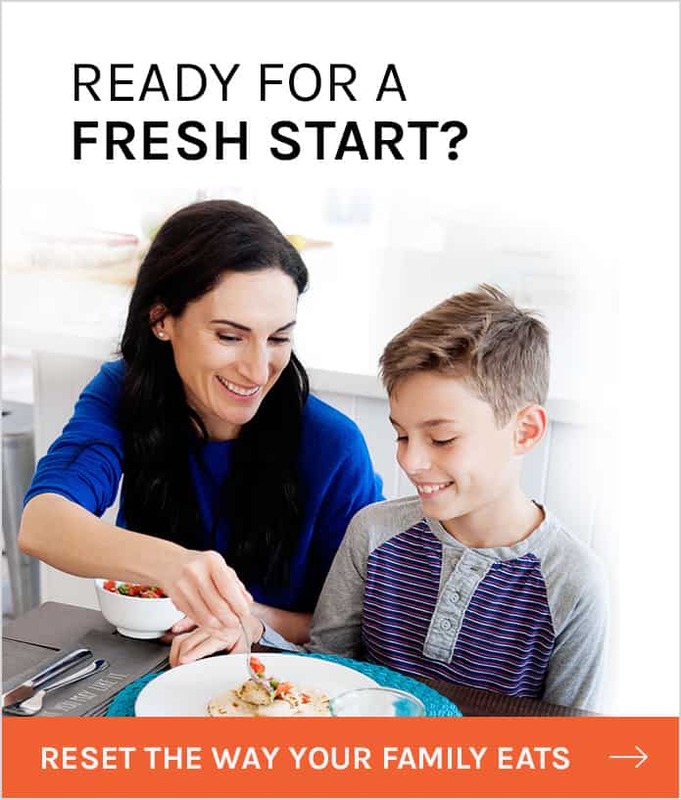 What’s great about this recipe, is how you can put it in the oven and forget about it long enough time to help the kids finish their homework before dinner or do all the things that call out your name. 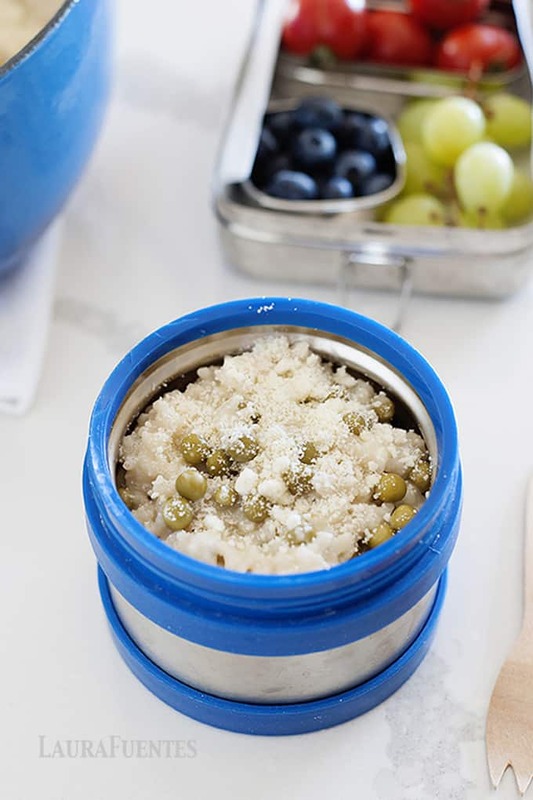 Leftovers are never a problem because they easily heat up the next morning and the Thermos does its job by keeping it warm until lunchtime. Pair it with some fruit, a little deli turkey rolled up as a side for protein, and you are good to go! How do you incorporate veggies into your dishes? Place Arborio rice and 4 cups of the chicken stock inside a 5qt Dutch oven (cast iron pot). Cover and bake for 45minutes, until most of the liquid is absorbed and the rice is al dente. Remove pot from oven and place on cooktop. Add remaining chicken stock, Parmesan cheese, white wine, butter, salt, and pepper into the pot. 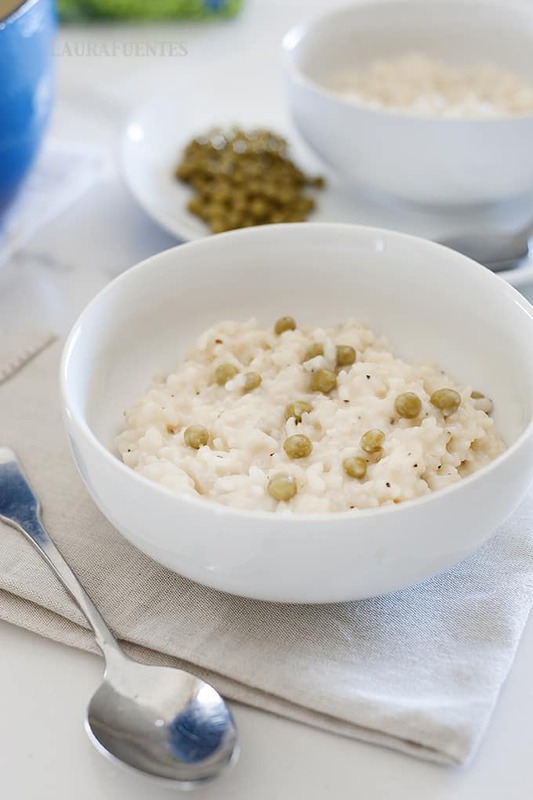 Stir continuously to break down the start of the risotto for 2 to 3 minutes, until the rice has thickened and is creamy. 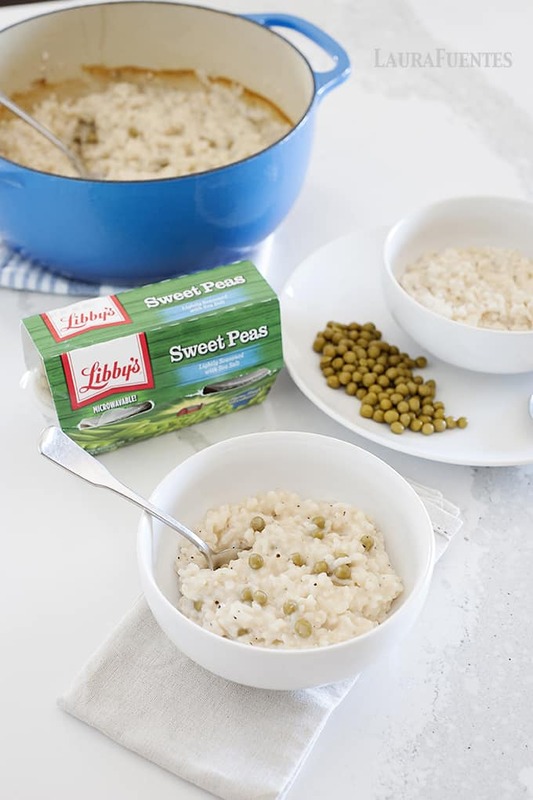 Serve plain creamy parmesan risotto into a bowl with the peas on the side for the kid who doesn’t like veggies mixed in, and for the remaining risotto, add in 2 drained cups of Libby’s Sweet Peas, totaling 1 cup of peas. Stir for about a minute and serve hot with additional parmesan cheese. I keep it simple. Side dishes are vegetables. My favorite way to get kids eating vegetable side dishes is to roast the veggies. 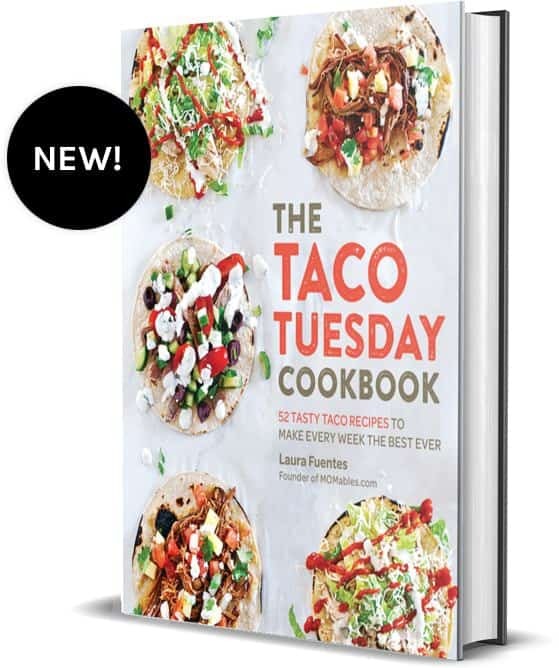 This brings out a different flavor in vegetable, and I have yet to find a roasted veggie that my kiddos won’t eat- and that’s saying something!